This circle gives students an opportunity to name the things that are bothering them. They find they are not alone. Teachers are sometimes surprised to learn that the things they are frustrated by are also a source of distress to students…even those who misbehave. 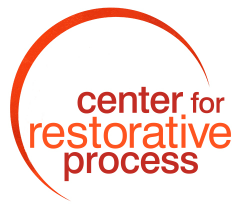 This activity provides a foundation for restorative discussions in future circles. Students will develop a list of things that affect them or other students in negative ways. Students will have an open and honest discussion of the issues affecting this class’s functioning as a learning community. You will need to have a talking piece and materials. For this circle do NOT post the guidelines. Have a poster of the class agreements ready to post, but reserve it for the end of the circle. Ask students to raise hands if they remember a circle guideline and call on them to share what they remember. Stay with this until the four guidelines and respect for the talking piece have been remembered. You will review circle agreements at the end of this lesson. Invite students to set up the center. Check to see if any of them would like to offer a dedication. If they decline or do not feel ready, offer one yourself. It’s a good idea to write the list on a large piece of paper so you can save it and refer to it in future meetings. Ask the students to help you divide the list into ripple effects they like and ripple effects they don’t like. This can be a lively activity and some strong feelings may emerge. Let students know that they will be working with this list in the next circle to begin discussing how they are affected by some of the behaviors, and where the effects are painful or harmful, to begin working toward making things better. 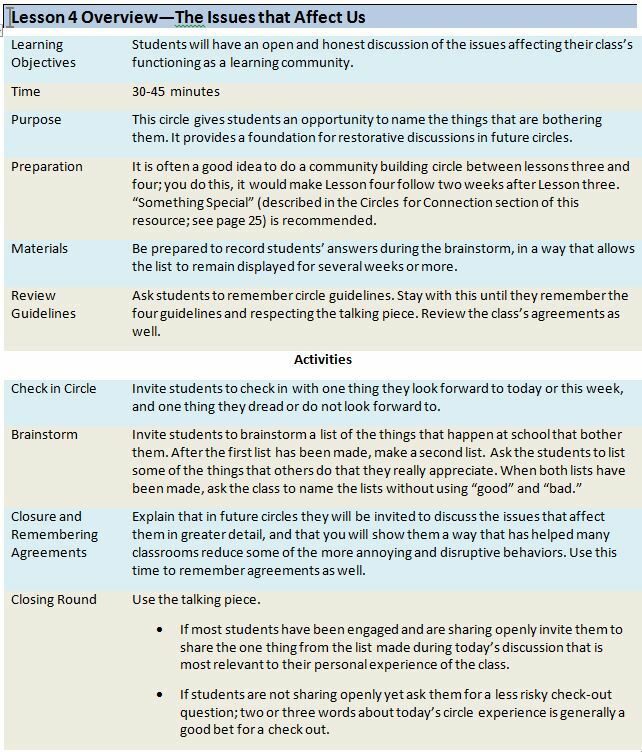 Let the students know that in future circles they will be invited to discuss the issues that affect them in greater detail, and that you will show them a way that has helped many classrooms reduce some of the more annoying and disruptive behaviors. 1. Anyone can ask for an agreement at any time. 2. Anyone can ask to modify an agreement at any time. 3. If there is no consensus about a proposed agreement, it is not an agreement, and it is the responsibility of each member of the circle to be mindful of this fact. For example, if even a single student does not agree to keep things shared in the circle confidential, then there is no confidentiality agreement and all students should keep this in mind when they share. Maintaining the agreements is everyone’s responsibility (not just the teacher’s). It is possible that students may want to propose additional agreements at this time, or modify existing ones. If time permits go ahead with this; it is a great way for students to take more ownership. If not, consider scheduling an additional circle just for this purpose. For a check out round, use the talking piece. If most students have been engaged and are sharing openly, invite them to share the one thing from the list made during today’s discussion that seemed most relevant to their personal experience of the class. If students are not sharing openly yet ask them for a less risky check-out question; two or three words about today’s circle experience is generally a good bet for a check out. When you close by asking the students to share three words about their experience in the circle today, be prepared for responses that may seem negative. As the talking piece goes around you’ll likely hear a wide range of comments. Some of them will be negative: “Boring.” “Pointless.” It can be frustrating for a circle leader to hear these comments. You may even be inclined to take it personally, the equivalent of if they had said “You are boring and pointless.” But this is a mistake. Circles are all about authentic sharing. If the comments are heartfelt and authentic, they are important. Is the circle boring? Is it pointless? If so, it’s best to dive right in and have a circle discussion to explore why. Doing so can be a turning point for the circle, changing it from dialogue about topics that are hypothetical (and therefore risking irrelevance), to the actual hear-and-now reality felt by everyone in the room. Typically the first time we “get real” in a circle comes about precisely in this way: when the circle isn’t going well and someone points it out. Therefore, if criticism arises about the circle, make room to discuss it. You can invite open discussion with simple questions like, “What is it that makes it boring? What would make it more interesting?” You don’t have to use a talking piece for this discussion, but a talking piece might help if not many students are sharing their thoughts. You’ll likely be pleasantly surprised by some of the insightful and helpful answers that emerge. So, they are saying it’s pointless and boring. Is it? If so, congratulations! Your circle just “got real.” Now real progress is possible.